​Blue Frog Studios is located in the west coast beach-side town of White Rock, BC, about 40 mins south of Vancouver. Its state-of-the-art concert theatre was designed as a large commercial recording studio that would accommodate an 80-piece orchestra. From the 23-foot high ceilings, to the river rock walls and beautiful hardwood floors, you know you are in a special place. The studio provides world-class sound and lighting, as well as 4K video and audio recording technology with an unparalleled production team. Producers love the great sound that comes out of this studio and artists can't wait to perform. In 2010, an experimental concert was produced with Grammy Award winning artist Dan Hill. Three shows were instantly sold-out and owners Kelly and Juanita knew that they were on to something. The live concert production side of the business has developed into nearly 150 concerts per year. Many of the concerts have been recorded resulting in studio quality live albums. 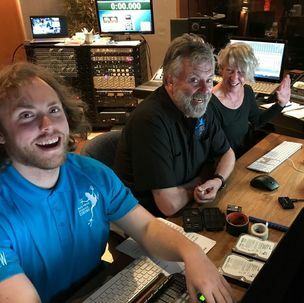 In 2014, Blue Frog took another "hop" forward by producing a world-wide live stream broadcast for Earth Day, with San Francisco band Jefferson Starship. Following that, a full DVD video shoot for the amazing Alfie Zappacosta. Blue Frog was now the room for live concert video productions with its studio sound and perfect video sound stage lighting and design. Things continue to progress with the BLUE FROG LIVE streaming channel complete with live switching of the concerts. The live streaming shows draw thousands of viewers from around the globe. ​"I WANT TO KIDNAP BLUE FROG STUDIOS AND TAKE IT AROUND THE WORLD WITH ME. I CAN'T WAIT TO COME BACK!" ​"LOVE BLUE FROG; What a Great Room"
Live concerts started in October 2010 with Mr. Dan Hill, best known for his Grammy Award winning song "Sometimes When We Touch". Three sold-out shows and the successful concert series was off and running. THE BOSS: Co-owner Kelly keeps the hits comin'. He makes sure a steady stream of amazing talent is here to perform recording sessions, live shows and video shoots. 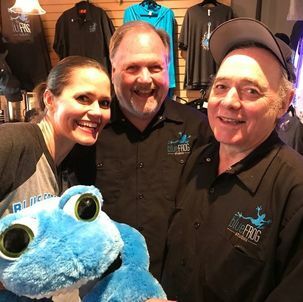 ​The BOSS-IEST: Co-owner Juanita keeps the Frog hoppin'. This former studio session singer and touring artist loves making the magic happen. 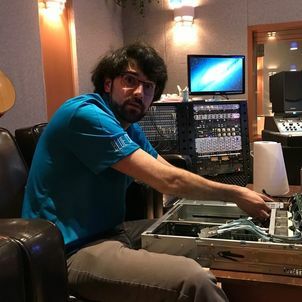 ​Musicians know Pat as one of Canada's premier engineers. Two time JUNO Nominee, Pat has engineered albums for Bad Company, Paul Rodgers, Loverboy, Skywalk, Chilliwack & more. Lights, Cameras, ACTION...it all happens in the Flight Deck of Blue Frog Studios. Rob, Tom and Marlene make sure the video shoots take off. A true Rock Star of Blue Frog. A rare combination of technical expertise and creative genius. Oh, and he also makes delicious homemade chocolates. Like the crew on a First Class flight, Lucia, Bob, and Chris get concert goers checked-in, seated and "Ready For Take-Off"